Double door cabinets are are available in four heights and three widths. The 5-high cabinet may also be ordered with a side-to-side coat rod instead of shelves. Concealed hinges are self-closing and allow for 110 degree opening. Double door cabinets are available in four heights and three widths. The 5-high cabinet may also be ordered with a side-to-side coat rod instead of shelves. Concealed hinges are self-closing and allow for 110 degree opening. Double door cabinets are available in four heights and three widths. The 5-high cabinet may also be ordered with a side-to-side coat rod instead of shelves. Concealed hinges are self-closing and allow for 110 degree opening. Double door cabinets are 36” wide, and are available in 4 heights. The 5-high cabinet may also be ordered with a side-to-side coat rod instead of shelves. Nickel-plated, concealed hinges are self-closing and allow for 110 degree opening. When you need to keep your office in order the easiest solution is to invest in a filing cabinet! The Great Openings standard lateral file cabinet features 2 drawers with ample space that accommodates letter, A4, and legal files. When you need to keep your office in order the easiest solution is to invest in a filing cabinet! The Great Openings standard lateral file cabinet features 3 drawers with ample space that accommodates letter, A4, and legal files. When you need to keep your office in order the easiest solution is to invest in a filing cabinet! The Great Openings standard lateral file cabinet features 4 drawers with ample space that accommodates letter, A4, and legal files. When you need to keep your office in order the easiest solution is to invest in a filing cabinet! The Great Openings standard lateral file cabinet features 5 drawers with ample space that accommodates letter, A4, and legal files. When you need to keep your office in order the easiest solution is to invest in a filing cabinet! The Great Openings standard lateral file cabinet features 6 drawers with ample space that accommodates letter, A4, and legal files. When you need to keep your office in order the easiest solution is to invest in a filing cabinet! The Great Openings standard lateral file cabinet features two drawers with ample space that accommodates letter, A4, and legal files. When you need to keep your office in order the easiest solution is to invest in a filing cabinet! The Great Openings standard lateral file cabinet features two drawers with ample space that accommodates letter, A4, and legal files. Sometimes you need a file organizer that can be easily moved. In that case Great Openings has mobile pedestals that do just that, hold your documents and feature four black plastic casters for easy movement! When you need to keep your office in order the easiest solution is to invest in a filing cabinet! The Great Openings standard lateral file cabinet features muliple drawers with ample space that accommodates letter, A4, and legal files. Sometimes you need a file organizer that can be easily moved. In that case Great Openings has mobile pedestals that do just that, hold your documents and feature four black plastic casters for easy movement! When you need to keep your office in order the easiest solution is to invest in a filing cabinet! The Great Openings standard lateral file cabinet features two drawers with ample space that accommodates letter, A4, and legal files. When you need to keep your office in order the easiest solution is to invest in a filing cabinet! The Great Openings standard lateral file cabinet features 2drawers with ample space that accommodates letter, A4, and legal files. Sometimes you need a file organizer that can be easily moved. In that case Great Openings has mobile pedestals that do just that, hold your documents and feature four black plastic casters for easy movement! When you need to keep your office in order the easiest solution is to invest in a filing cabinet! The Great Openings standard lateral file cabinet features two drawers with ample space that accommodates letter, A4, and legal files. Sometimes you need a file organizer that can be easily moved. In that case Great Openings has mobile pedestals that do just that, hold your documents and feature four black plastic casters for easy movement! The Lateral File has a heavy duty, full drawer extension on steel ball bearing telescoping slides. All units feature anti-tipping drawer interlock system that allows only one drawer open at a time. Side to side rails support letter and/or legal filing with adjustable leveling glides. Top drawer of 5-Drawer Lateral is a roll-out shelf. Single key removable lock. The Lateral File has a heavy duty, full drawer extension on steel ball bearing telescoping slides. All units feature anti-tipping drawer interlock system that allows only one drawer open at a time. Side to side rails support letter and/or legal filing with adjustable leveling glides. Top drawer of 5-Drawer Lateral is a roll-out shelf. Single key removable lock. The Lateral File has a heavy duty, full drawer extension on steel ball bearing telescoping slides. All units feature anti-tipping drawer interlock system that allows only one drawer open at a time. Side to side rails support letter and/or legal filing with adjustable leveling glides. Top drawer of 5-Drawer Lateral is a roll-out shelf. Single key removable lock. 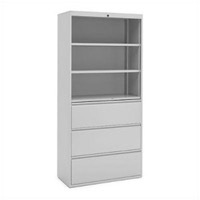 Save up to 70% on Metal Wardrobe Cabinets and office storage cabinets. As an added benefit you receive FREE SHIPPING on all of our Great Openings Metal Lateral File Cabinets.